Tree trimming is a dangerous job. 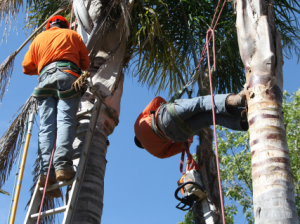 Worker’s comp insurance is very costly in CA which has created a thriving shadowy trade in which unlicensed tree businesses or individuals are able to undercut legitimate companies by charging way less. These people are breaking the law and putting you at risk. If they get injured they could sue you. Also, if they damage your neighbor’s or your property, you could be responsible and they would disappear. These companies hire illegal workers, paying them minimal wages and they do not know how to trim trees. We call them hackers and butchers. They often destroy trees, structurally weakening them at worst and destroying their great looks at best. We are often hired to try to trim a tree back to a good shape. This takes years and a lot of money. Please do not support these renegades; ask for proof of liability and workers comp insurance and for their contractors license, bother to check to see if the information is valid. By the way, bona fida landscapers need workers comp. 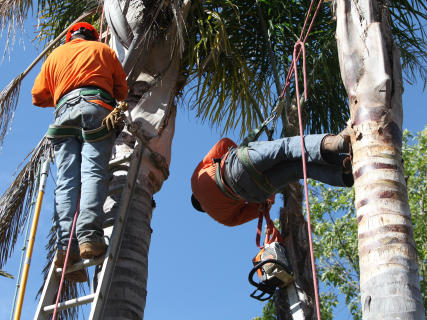 insurance too, their coverage will only cover tree work if performed from the ground, as soon as they step up on a ladder or onto the tree it goes from about 13% to 25% of their employees salary. In the tree business if a proposal sounds too good to be true believe me it will be.